The Chamblee Lady Bulldogs improved to 22-0 on the season with a 3-0 win over Bainbridge last Friday at Chamblee in the second round of the Class 5A girls’ state playoffs. Junior Olena Bilukha won in a 6-0, 6-0 straight set victory at No. 1 singles for the second consecutive state playoff match to improve to 16-0 on the season and 49-0 in her career. Senior Leeza Ershtein eased to a 6-1, 6-0 straight set victory at No. 3 singles while improving to 21-0 on the season (19-0 at No. 3 singles). Madeline Meer and Madison Trinh remained undefeated at No. 1 doubles at 7-0 with their 6-2, 6-0 victory. Grace Pietkiewicz had a 1-0 set lead in her No. 2 singles match after winning the opening set 6-2 before being pulled with the match clinching point by her team. Emilya Ershtein and Ellie Gies were up 3-0 in the first set of their No. 2 doubles match when the match ended. The Lady Bulldogs move on to the Elite 8 to face Union Grove at 1:00 pm on Friday at Union Grove. Union Grove won 4-0 over Statesboro and 3-1 against North Springs to advance to the Elite 8. 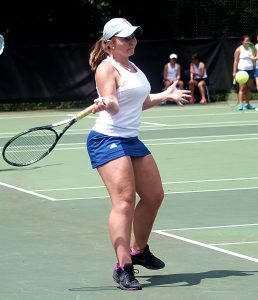 Chamblee is the lone remaining tennis team from DeKalb in the state playoffs as the other four entries dropped their second round matches. The Chamblee Bulldogs (13-6) saw their season end with a 4-1 loss to McIntosh on Tuesday. The No. 2 doubles team of Jake Buschand and Isaac Schwartz won the only point for Chamblee with a 4-6, 6-4, 10-7 tiebreaker victory. The Druid Hills Lady Red Devils lost a much closer than it looks 3-0 Class 4A match at Heritage-Catoosa on Monday. Heritage clinched on a third set tiebreaker in singles. The Tucker Tigers (13-3) and Lady Tigers (13-3) both had their seasons end on Tuesday at Sugar Creek. Both teams lost 5-0 decisions to their counterparts from Creekview.